Bam! Yummo! It’s A Good Thing! Hmmmmm, what’s the phrase that I say most in the kitchen? Turn up the music! — No, that doesn’t have anything to do with food, but it does have everything to do with cooking. I love to cook to Jackson Browne, Barry White, even ABBA. Not Bruce Springsteen, though. His music is best for cleaning the house. Bugger, I just cut my finger again! — No, that one doesn’t encourage much faith in my kitchen skills. Argh! 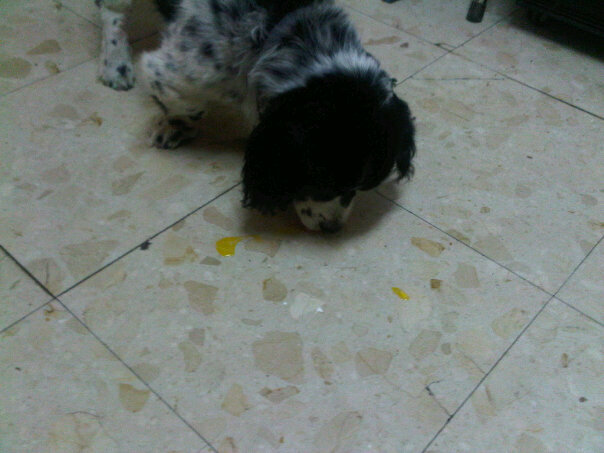 I just dropped an egg, will someone get the dog in here to clean it up? — Forget it, that one is so not made for Food TV! How about… This rocks! I say that a lot after I taste something. A little hubris-y, I admit, but hey, it does rock! Okay, so I don’t have my own cooking show (yet), but I’m getting there, one Dalia Bar at a time! The other day I posted some of my food pics to Facebook. My friend Debza, who’s been through thick and thin with me since the 8th grade, commented on one picture and said, “Wow, who knew you were Martha Stewart?” Okay, I’ll take that one as a compliment, although I would much rather be compared to Nigella Lawson or Carine Goren. Just don’t liken me to Rachael Ray or I’ll gouge your eyes out with a Microplane zester, okay? It’s actually quite simple to make, it set like a dream, and was very yummy at several BBQs we’ve thrown since I first Martha-ed up this concoction. We spread it on grilled chicken, have it with toasted pita, I’ve even drizzled it on my corn muffins. It’s a good recipe. And you know what? Wash and dry the cherry tomatoes. Place them in a large pot and add the lemon juice. Using medium heat, bring it up to a boil. Don’t worry that there’s no additional liquid in there, the tomatoes break down relatively quickly. Once they’ve come to the boil, lower the heat and let it simmer for about 30 minutes. Add the sugar. Turn the heat up back to medium and let the stuff come to a boil again, and then turn the heat back down to low and simmer for another 45 minutes to one hour. To check if the jam is ready place a small amount on a cold plate (I put a plate in the fridge when I started cooking, especially as it was a hot day). You then put the plate in the freezer for about 2-3 minutes. When you remove it from the freezer, draw a line through the jam with your finger. 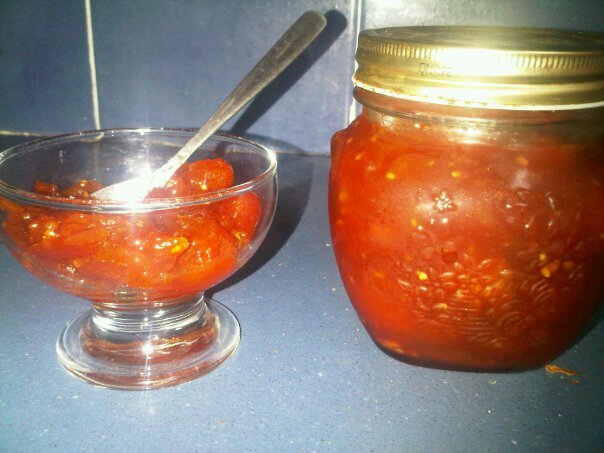 If the line remains, the jam is ready to be poured into your jars. If not, return the pot to the heat and retest after a few minutes. 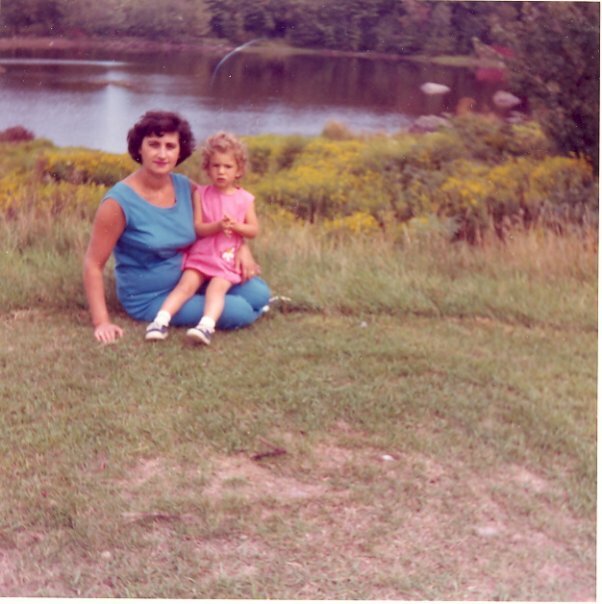 When I was two years old my mom and I would sit side by side in ancient beach chairs on top of a mountain in the Catskills and soak up the sun and she would tell me stories of what it was like to be a little girl in the Vilna Ghetto. I just loved hanging out with my mom. When I was six years old and had a friend over to play my mom would peek her head into the bedroom, disrupting whatever drama was unfolding in the Barbie house, I wished my mom would go back into the kitchen where she belonged. When I was 10 years old and my mom came to my school for Parents Day and she was the only mom dressed there in pants (and polyester pants, noch!) I just wanted to keep on asking for the bathroom pass and leave the room for the whole day. When I was 13 and we were back in the Catskill Mountains and all my cool friends where sneaking off to smoke cigarettes in the woods and my mom insisted I come and sit with her and my grandmother in the shade of our bungalow and work on my knitting. I had such a crush on Leon but so did Debbie and she was out there with him and I was stuck with my mom knitting and my life was over. “But, Ma, everybody is there!” “You’re not everybody!” was her answer, always her answer…. And then I was 20 and leaving home forever and moving to Israel. My parents came with me to the airport and both cried but I was too excited to get on the plane to notice. A few months later my parents themselves made the trip when I married The X. They smiled and hugged and let me have my Bridezilla moments, all the while not liking the person I with whom I had chosen to spend the rest of my life. But they smiled, because deep down my mom had a secret — I am not everybody. And then I was 42, and getting married to a man that I just know my father would have adored, getting married to a man who would treat my mother with respect (even though she never could get his name right), and my mom was too weak and too scared to make the flight out to Israel for the wedding. “But, Ma, everybody’s mother comes out for their wedding.” And you know, by now, what my mother would have said to that. Six months ago I was proudly shlepping my husband out to finally meet my mom. I don’t know who was more nervous, but this meeting was finally going to happen. And then, Man plans, God laughs. The night before our flight we got the news that my mom had died quietly in her sleep, a burst aortic aneurism. She went in death as she never would have in life, quietly, no fuss, just a small sigh while she slept. And she is so right — I am not everybody! So to commemorate my first Mother’s Day without my mom, I offer you her recipe for shmaltz. 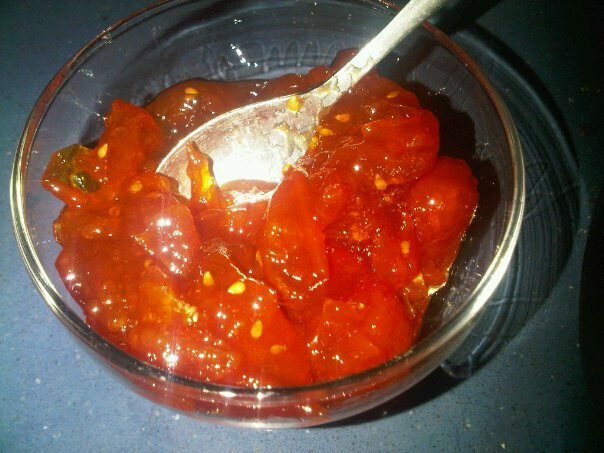 This stuff accompanied me throughout my childhood, always there, ready to support whatever meal my mother placed in front of me. Always there, ready to support, just like my mom. 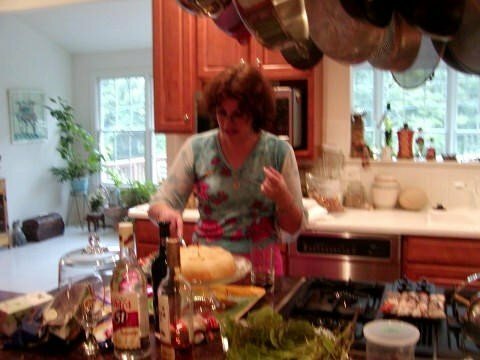 You can see my mom’s recipe for shmaltz as I originally posted it on Recipezaar in 2004. I wish I made it more often. I wish I had a picture of the stuff to show you, but I don’t, and thanks to widening family waistlines, I won’t be making this anytime soon. But if I ever do think of shmaltz, it always brings back wonderful memories of my mother. 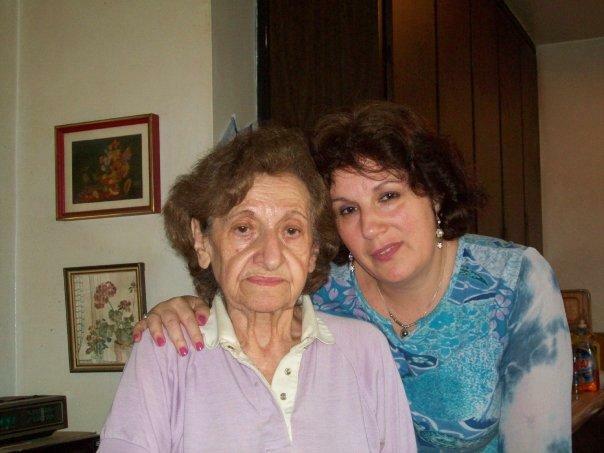 The last day I saw my mom, August 2008 -- I started to cry, because I didn't know if I was every going to see her again. "Why are you crying, Mamaleh?" she asked. I replied, "Because everybody cries when they say goodbye." And her reply, "You are not everybody!" She gave me a huge hug, an even bigger smile, and sent me back to my family.